The Shrewd Economist: Euro vs US Dollar. Time to Sell? Euro vs US Dollar. Time to Sell? 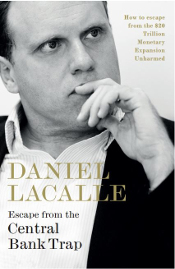 DANIEL LACALLE: After the French elections, the euphoria over the euro/dollar exchange rate is more than likely to dissipate. The revaluation of the European currency has been supported by consecutive political catalysts, which have supported the Eurozone project, and the trade surplus supports the euro versus the main currencies with which it trades. The global demand for euros decreases. The latest figures from the Bank of International Settlements (BIS) show total cross-border transactions in US dollars of $ 13.9 trillion, increasing by $60 billion in the third quarter of 2016. In turn, transactions in euros fell by $160 billion, to a total $8.1 trillion. Supply of euros rises. We are in a dangerous time. For the first time in history, central banks are increasing money supply by more than $200 billion a month without any crisis or recession. Of that figure, the European Central Bank is almost a third. At the close of this article, this enormous monetary expansion has already generated 1.2 trillion euros of excessive liquidity. Confidence in an export model and the trade surplus of the European Union, which makes the reserves of foreign currency of the Eurozone grow steadily, have been the main factors behind the relative strength of the euro. It shows that the European economy is more solid than some inflationists would like it to be. The evidence that devaluation does not favor exports is clear in the Eurozone. Since the launch of the ECB program, the euro has weakened almost 23% against the US dollar and yet export growth has slowed significantly. In fact, the most sustained increase in exports has been between countries of the euro area itself, that is to say, with no currency effect, while growth in exports to non-euro countries has weakened considerably. However, inflationary alchemists will continue to tell you that devaluing supports exports. We must not forget the challenge of supply and demand, and of excess liquidity. The European Central Bank is almost 200 bps behind the curve and should be raising rates already. In addition, with such an amount of excess liquidity, which increased by more than €1 trillion since the repurchase program was launched, it is urgent to drain that excess and stop increasing the ECB current balance sheet. There is enough liquidity in the system to continue supporting bond issuances. It is more than likely that the supply of US dollars will be contained, through the normalization of the US monetary policy, where the Federal Reserve also lags far behind the curve by almost 300 basis points, while global demand of the US currency increases, mainly from emerging countries. While demand for dollars is growing above supply, the reverse is true of demand for euros versus supply. Therefore, apart from political catalysts, markets are facing a few years in which the euro is more than likely to lose momentum with respect to the US dollar.